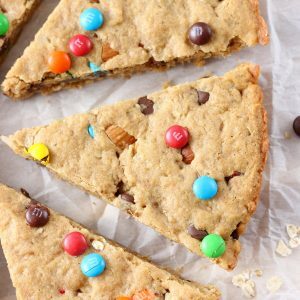 In less than 25 minutes, you can be biting into these warm, gooey Healthier Peanut Butter Granola Cookie Wedges that are filled with oats, peanut butter, and a sprinkling of chocolate! 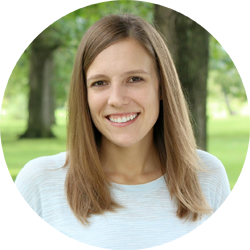 Last week I shared with you one of our favorite healthier peanut butter bars. More like a snack bar or breakfast bar and less like a dessert cake, those bars are great when you aren’t looking for anything with chocolate in it. But sometimes you want chocolate. Even better if peanut butter is involved. 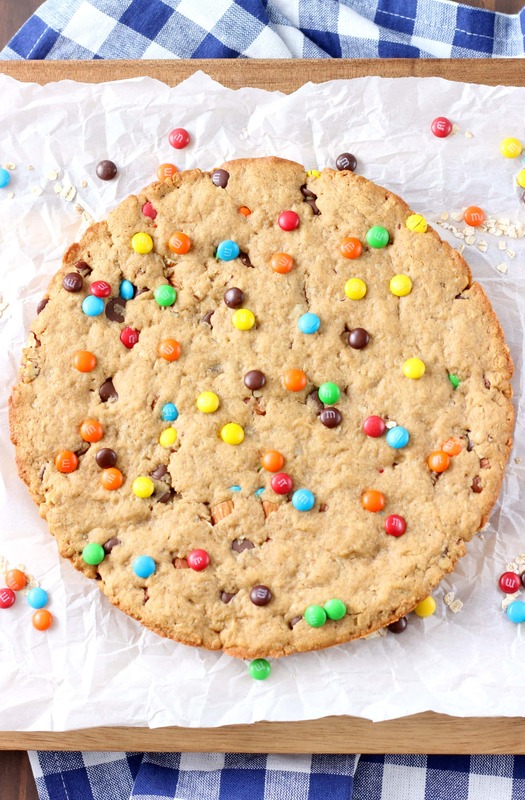 So, I made a giant cookie that can satisfy your chocolate cookie craving without taking up your precious time or without eating lots of refined sugars and fats! White whole wheat flour, oats, honey, and an egg white make this delicious cookie lighter than your average cookies. And it really is super easy. You don’t even need a mixer. Just whisk together the wet ingredients, whisk together the dry ingredients and stir the two together. Mix in the nuts and chocolate, press the dough into a pie plate, and bake! Then try hard to wait until the cookie has cooled enough so you don’t burn your mouth! Pressing cookie dough into a pie plate and baking it is one of the best things I have done. 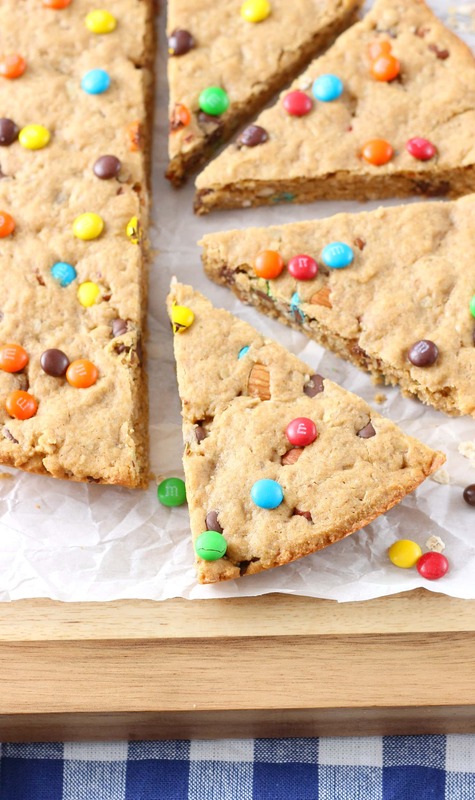 The result is a thick, soft and chewy cookie that you can cut into big pieces! Or you can just grab a fork and dig in. No judging here! Preheat oven to 350. Lightly spray a 9 inch pie plate with non-stick cooking spray. In a small bowl, whisk together honey, peanut butter, oil, egg white, and vanilla extract. In a large bowl, whisk together flour, oats, brown sugar, baking soda, and salt. Add wet ingredients to dry ingredients and stir until combined. Stir in pecans, almonds, chocolate chips, and M&Ms. Spread batter into the bottom of prepared pie plate. Bake for 12-15 minutes or until cookie turns golden brown. I love how you gave these a healthy twist. Now I won’t feel bad having an extra big wedge!!! 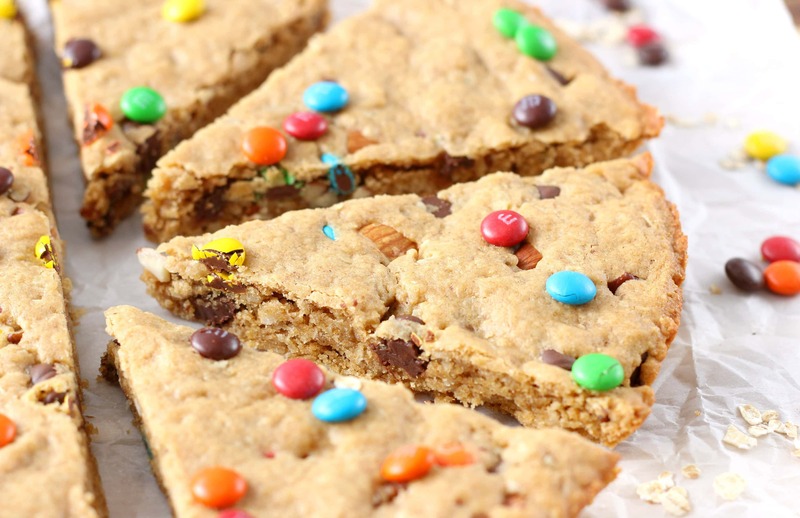 the peanut butter and granola in the cookie wedges… yum!!!!! Do you think I could use a whole egg instead of the egg white? Looks delicious! Thank you. I love skillet cookies and cookie cakes, because the thicker the cookie the better in my opinion! This healthier version is a great option and sounds like it would make a great snack as well! I adore your healthier twist and this flavor combo! Can’t wait to try! Love this lightened up version! It looks like it’s quick and easy too! These look absolutely amazing! Hard to believe they’re a healthier version! Love this! Making it for my cookie monster husband! Love this healthier version! These look amazing!! 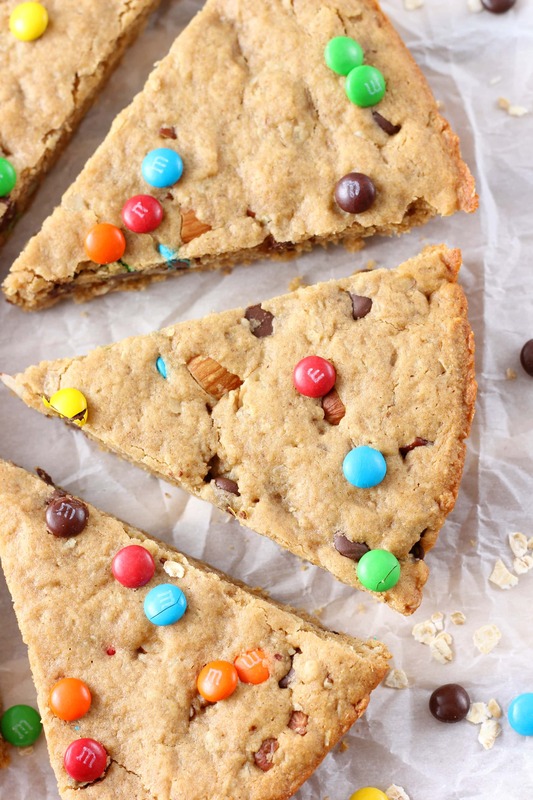 How fun are these cookie wedges?! I love that they’re on the healthier side and filled with peanut butter, too. My kind of treat! we use peanut butter that needs to be stirred originally. will this type not work in this recipe? The texture will be a bit different and the dough can be dryer (depending on the brand of pb) because of how it incorporates into the the rest of the ingredients. You can give it a try, just know that you may need to add a bit more moisture and the texture might look slightly different from what’s pictured. It’s hard to give consistent instructions using the peanut butter that needs to be stirred, because of how much it can change from brand to brand. That’s why I usually call for the no-stir kind in my recipes.